I have been playing stringed instruments all my life. I began with the banjo, added guitar and ended up in a hopeless love affair with mandolin. As my ear has evolved, my fascination with this instrument has grown. I've played and owned some of the finest mandolins available and I'm always amazed at the different character each instrument offers. 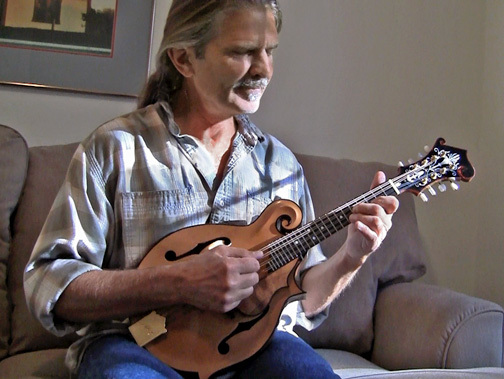 and sound great but I can't believe how amazing it really is now that I have it in my hands; there is no way I can put into words how awesome this mandolin really is." the scroll, the headstock inlay, and the overall finish is perfect." "Thank you for building me such a fine instrument. This was my first custom order and I was really quite nervous about spending this kind of money on and instrument I had never seen. The whole experience has been wonderful. You build a fine, fine, mandolin!"